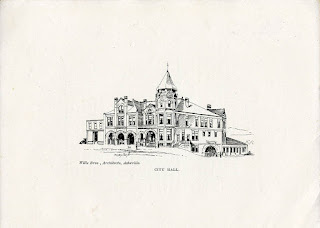 Artists Drawing of Original Station 1 (Headquarters). 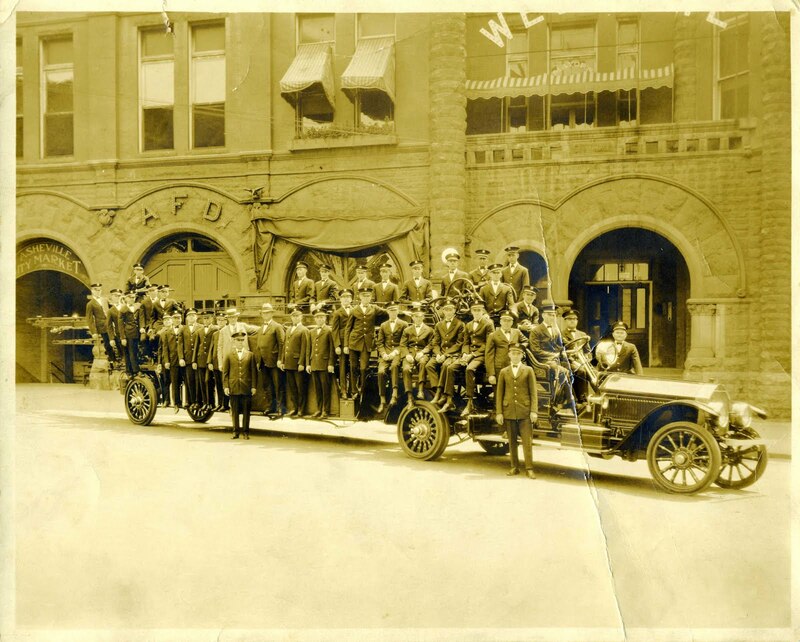 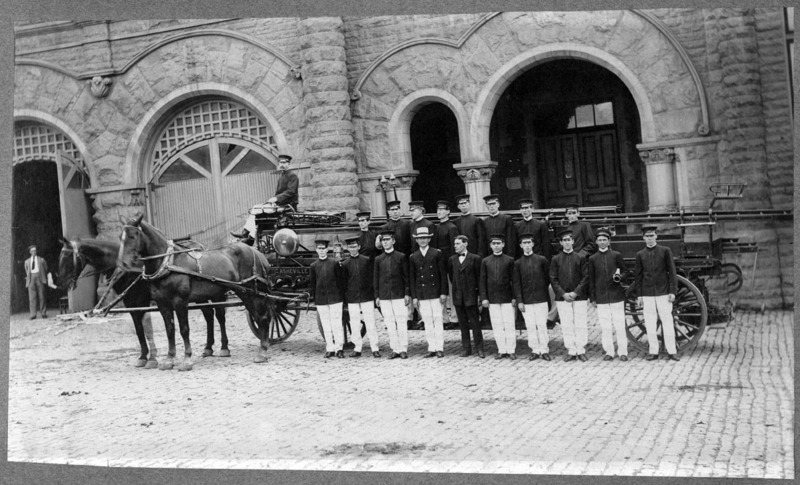 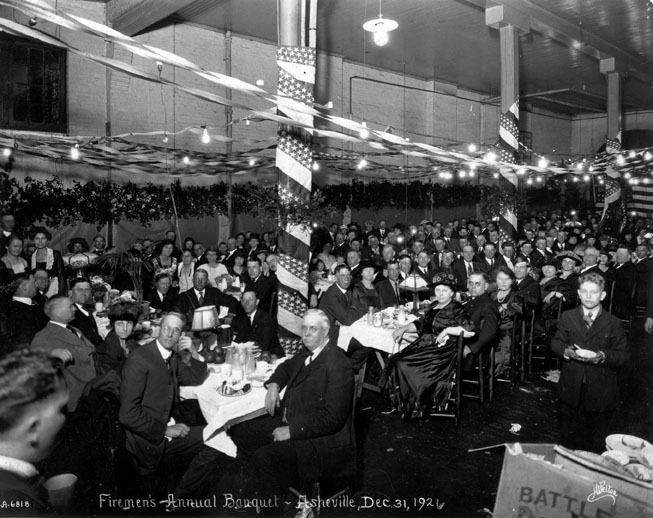 The first permanent fire station opened August 2nd, 1892. 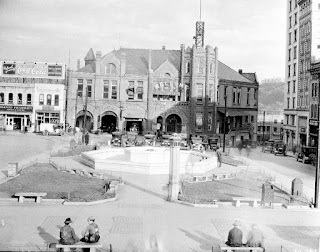 It included the fire department, police department, city hall, and a public market. 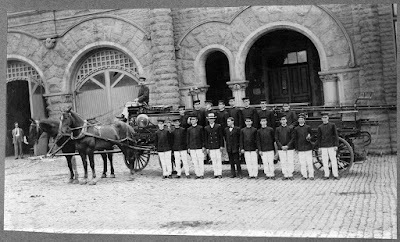 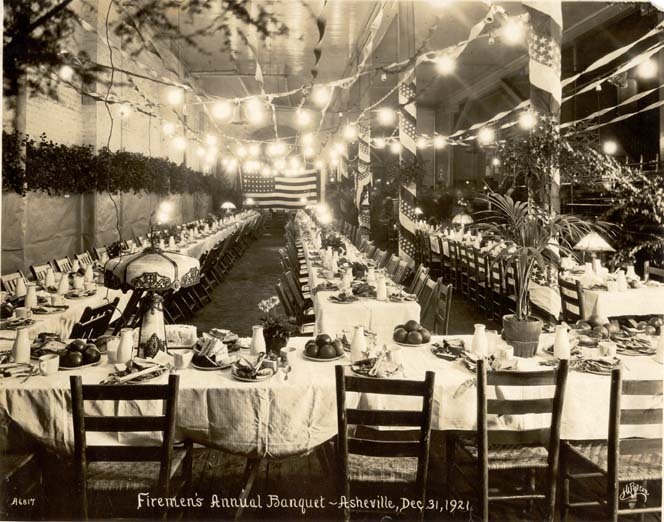 The fire department portion had two bays, horse stables, sleeping quarters for 8, and a brass pole. 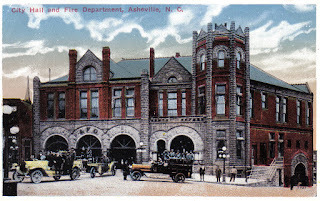 It was located on Court Square behind the sixth Buncombe County Courthouse and directly in front of the current Station 1. 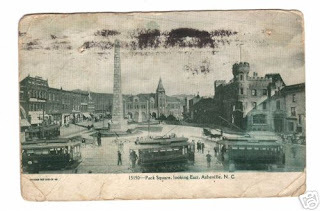 It was torn down in 1926. 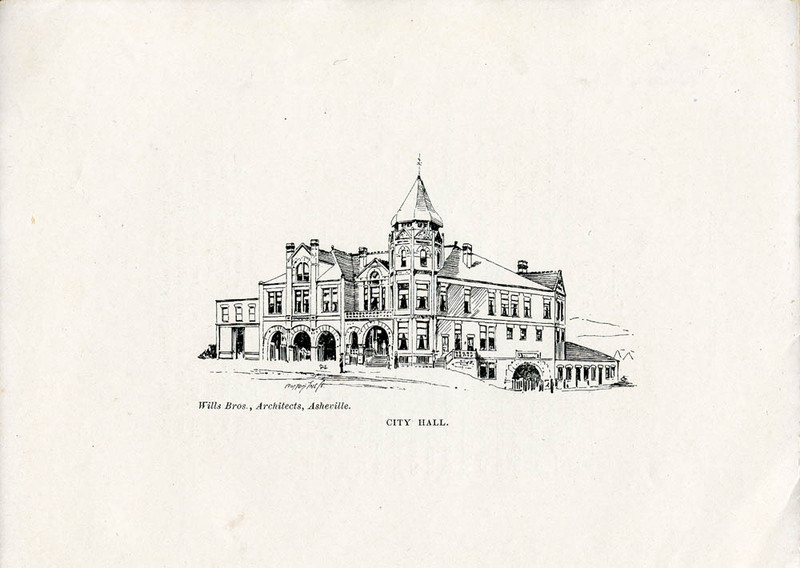 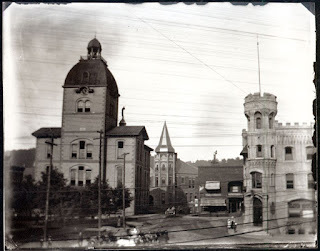 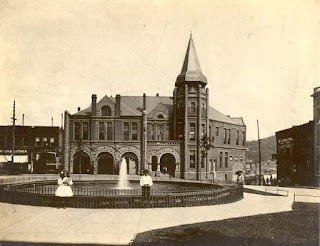 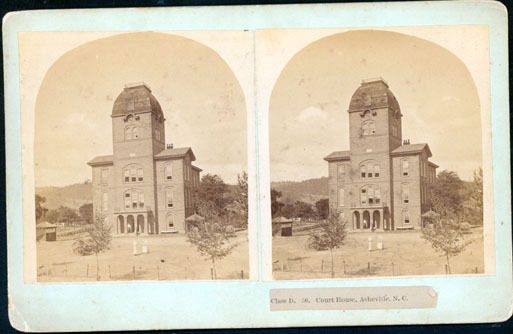 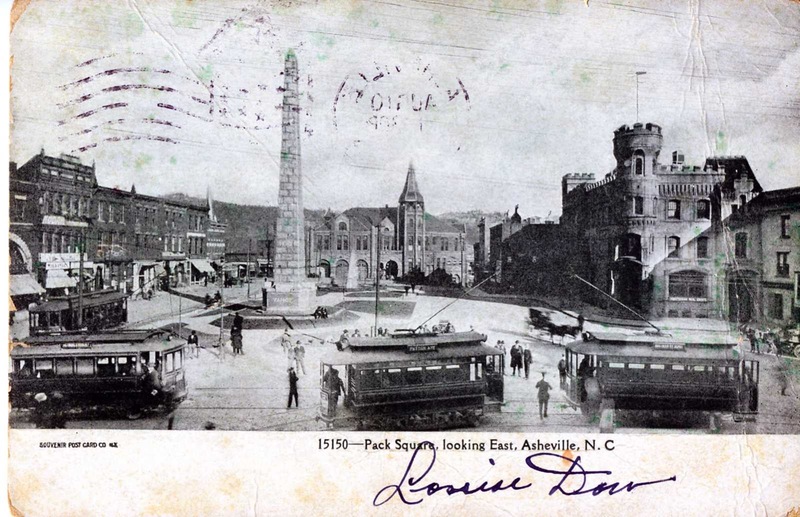 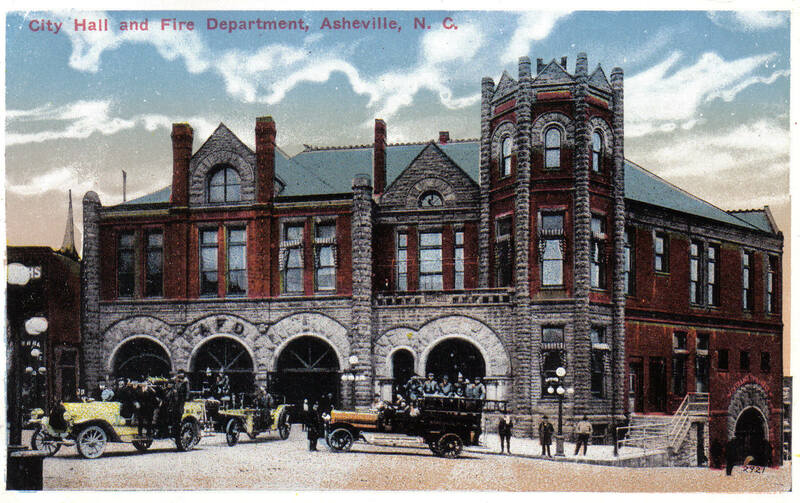 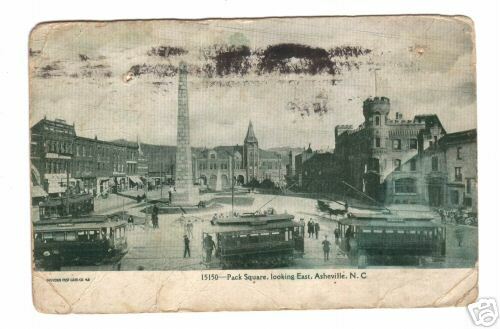 The sixth Buncombe County courthouse, at left, was constructed in 1877 and was the first meeting place for Asheville Fire Department after it was founded on May 2nd, 1882. 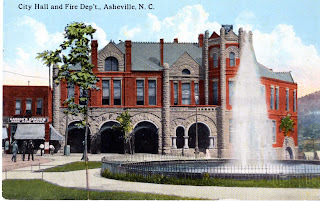 This building was used until AFD built their own first, permanent fire station directly behind the courthouse seen in the center of the photo with the cone-shaped roof. 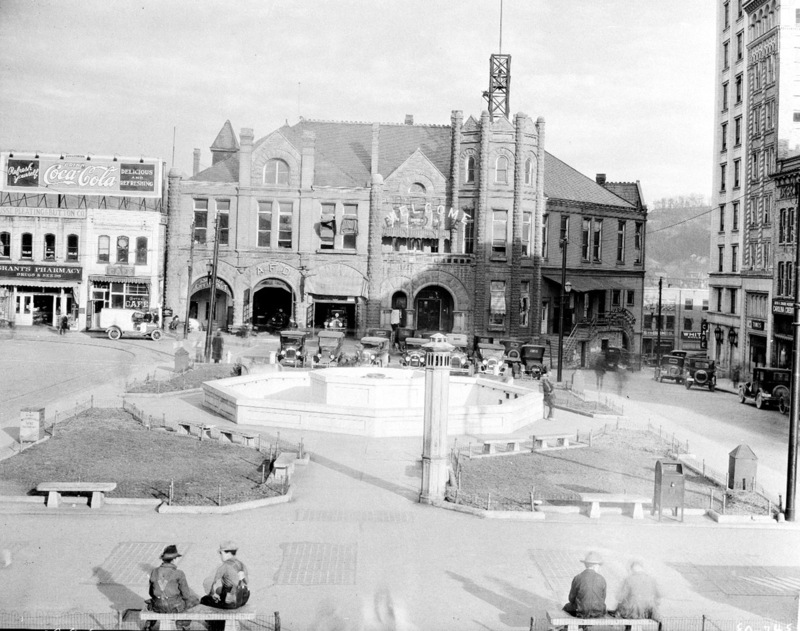 A fire bell was mounted on top of the courthouse. 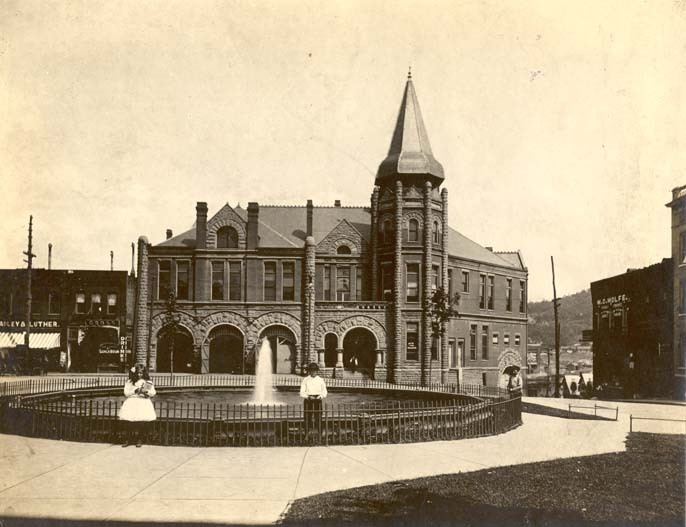 The courthouse was removed in 1903 when a new courthouse was built behind the fire station. 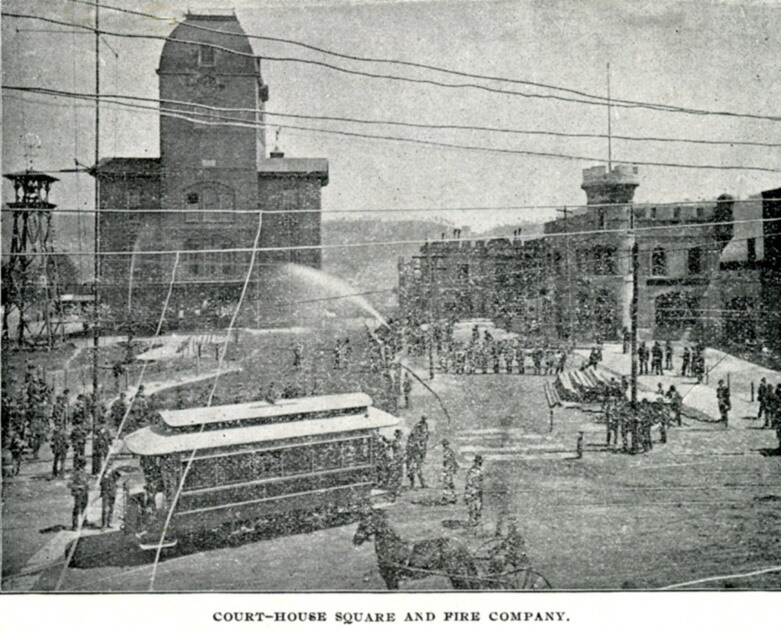 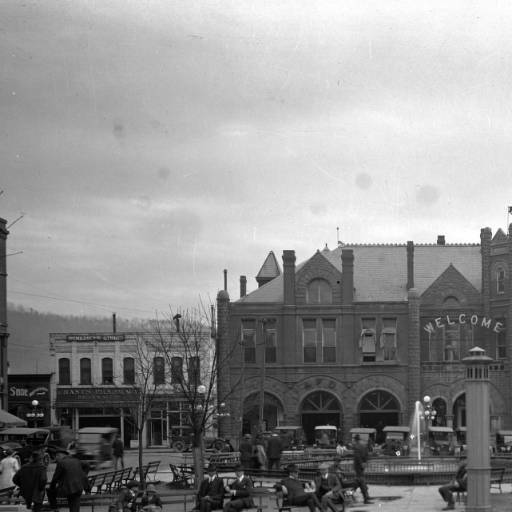 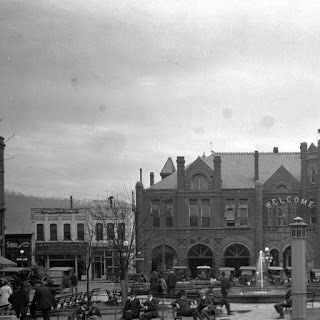 This is a very early photo of courthouse square with the hose company of the fire department spraying water on the courthouse. 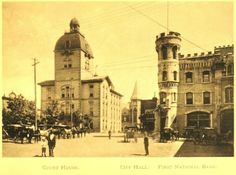 The first fire bell for the city and its original location can be seen in the tower to the left of the courthouse. 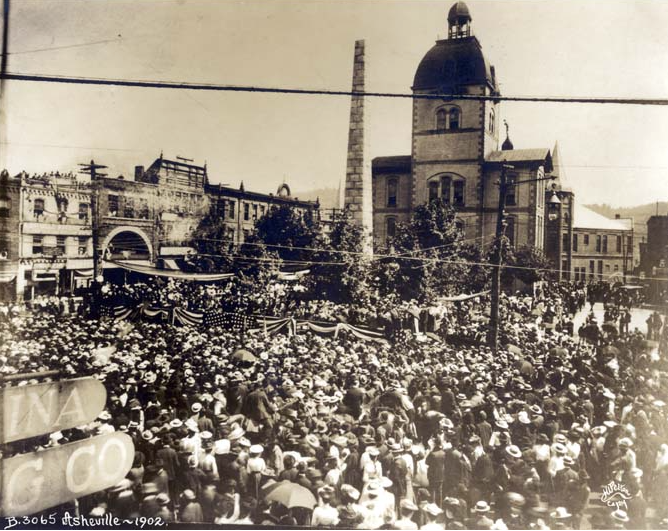 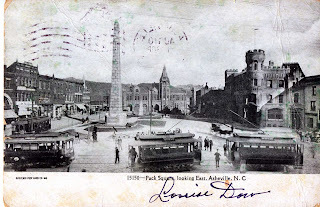 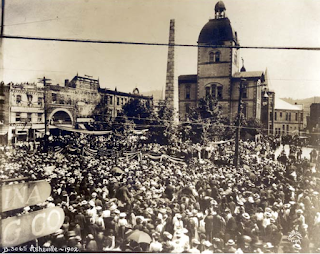 Theodore Roosevelt made a visit to Asheville in this photo. 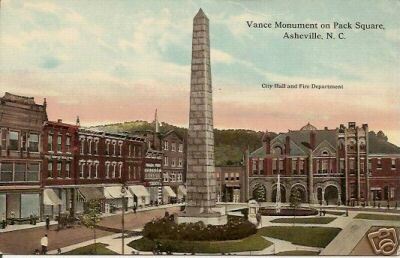 The Vance Monument was built in 1896. 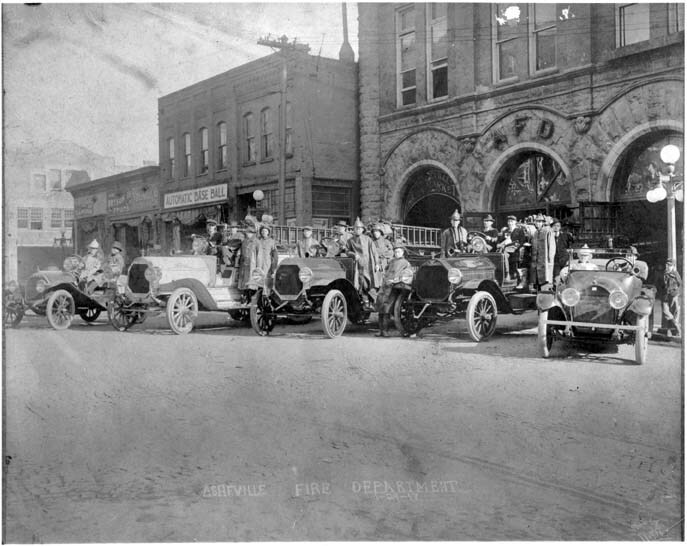 Original Station 1 showing first motorized apparatus - one red and one white Seagrave chemical engines. 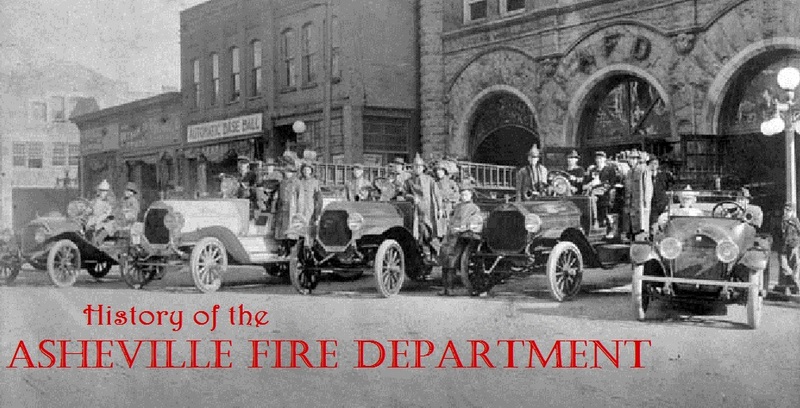 One of the engines is pulling the old horse-drawn hook and ladder truck. 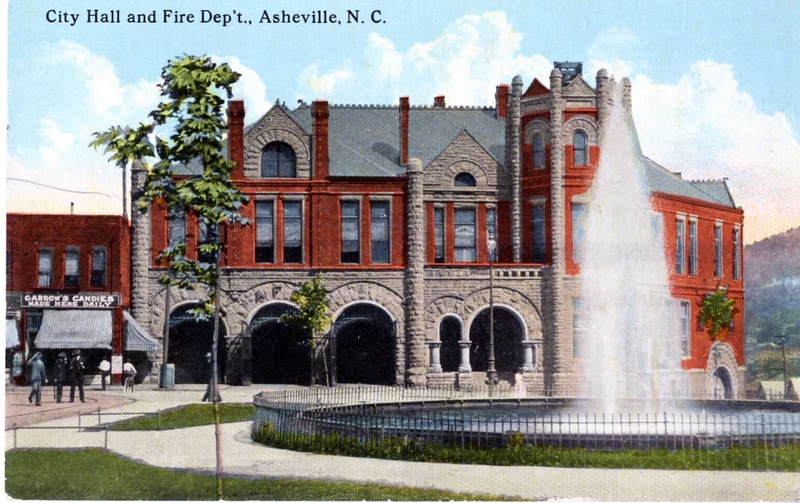 This shows the sixth Buncombe County Courthouse with the fire bell mounted on top and the position of original Station 1 behind it. Here you can see the fire bell, moved from the now-removed courthouse, mounted in a tower atop the station. 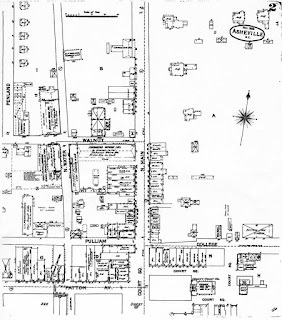 This is a Sanborn Insurance Company map of the north side of court square. 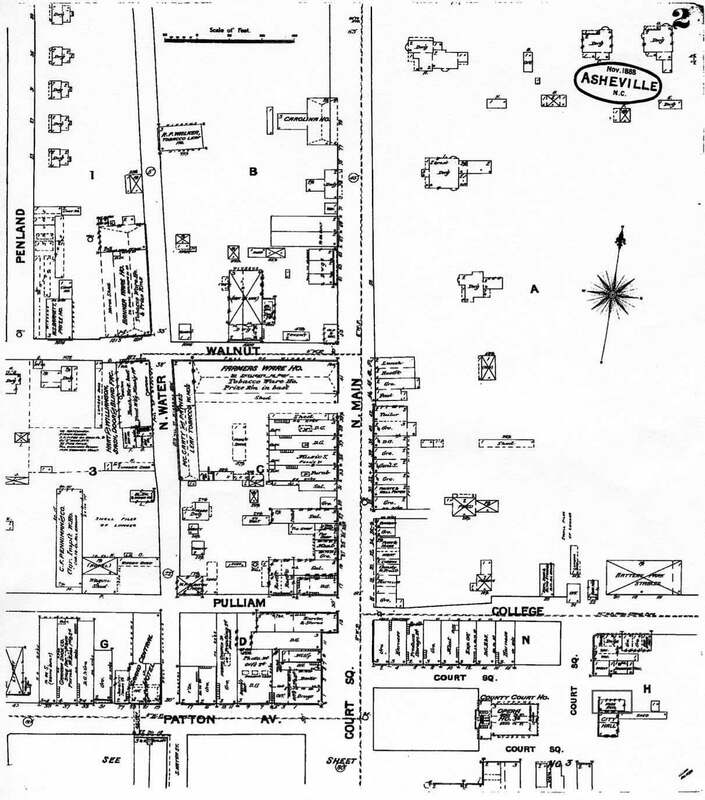 The bottom right of the image shows the location of the courthouse. 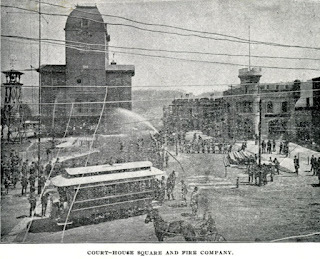 Behind the courthouse is a building highlighted to show the location of the first building to house the fire department's fire apparatus. 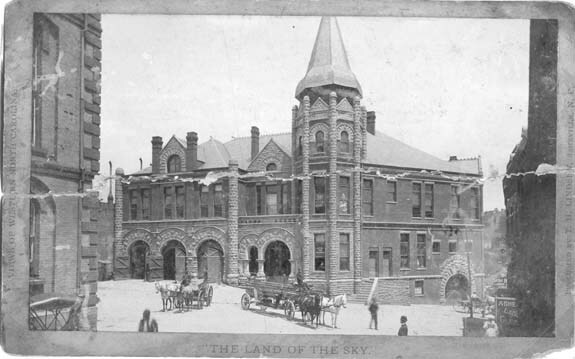 This building was made of rough plank and located next to the jail building. 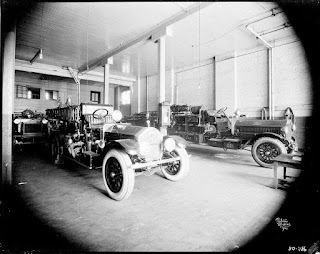 Inside Original Station 1 showing our first American LaFrance fire engine with a mystery truck behind it and our first Seagrave motorized city-service ladder truck.